The GREAT. BIG. VEGAN. SALAD. This is it. I could probably get away with not writing any introduction to this one and just let you drool. Drool over crispy pan-fried tempeh bacon, juicy tomatoes and creamy avocado. 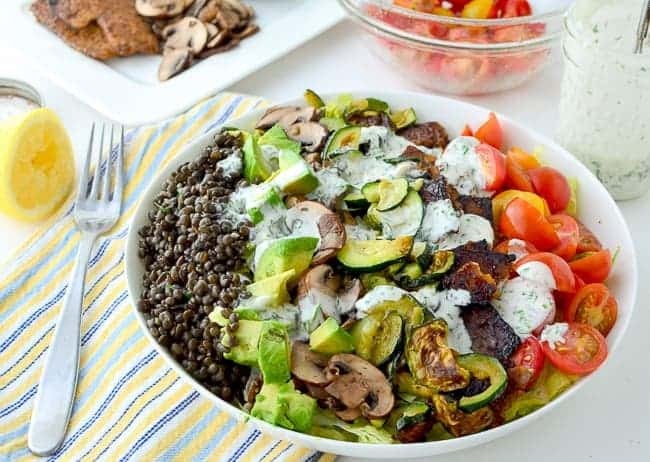 Wish you were currently snacking on a big bowl full of marinated mushrooms, roasted zucchini and simple herb lentils. But, I want to shout from the rooftops about how much I love this salad. Friends, this is what I’m talking about when I tell you to eat more salads. I double dog dare you to be hungry after enjoying this bad boy. Full of nutrients like iron (46% daily value), calcium, vitamin C, fiber (92% daily value) and protein. 30g to be exact. 30g of vegetarian good for you protein, minus the cholesterol and load of saturated fat. I made all the ingredients over the weekend and kept in individual containers in the fridge. During the week, I added a handful here and there to create this big bowl of beauty. With enough fiber and protein to keep me satisfied for hours, I am declaring this the salad that even salad haters will love. So go on, make all the layers or just a few but please promise me you will make this. Soon. Below you will find the quick ingredient and how-to list for creating 4-5 giant salad bowls. Preheat the oven to 400 degrees and make the lentils, zucchini and mushrooms first. While those are cooking, prepare the rest of the ingredients. Herbed Lentils: Cook 1 cup lentils, drain off any excess water. Toss lentils with 1 tsp. olive oil and 1/4 cup of whatever herbs you have lying around: chives, parsley, mint, basil. Marinated Mushrooms: Clean and thinly slice 8 oz. button mushrooms. Whisk together 1 tbsp. soy sauce, 1 tbsp. sesame oil, 1 garlic clove grated and 1/4 cup water or vegetable broth. Layer mushrooms in a baking dish and pour marinade on top. Bake for 15- 20 minutes in a 400 degree oven until roasted and slightly crispy. Roasted Zucchini: Thinly slice 3 zucchini into 1/2 moons. Toss with 1 tsp. oil and pinch salt/pepper. Arrange in a single file on a baking sheet and roast for 20 minutes, flipping halfway through. Tempeh Bacon: Very thinly slice an 8oz. package of tempeh. Whisk together 2 tbsp. maple syrup, 1 tbsp. olive oil, 1/2 tsp. cumin, 1/8 tsp. cayenne pepper, 1 tbsp. soy sauce, pinch freshly ground black pepper. Place temepeh in a shallow bowl and cover with marinade. Let soak for at least 15 minutes. To fry, place tempeh slices in a hot skillet and let cook 1-3 minutes per side until brown and crispy. Cook longer for crispier tempeh. Dairy-Free Ranch Dressing: 1/2 cup mayo or dairy-free mayo, 1/4 cup soymilk, handful of fresh parsley, roughly chopped, 1 tsp. dried dill, 1 tsp. garlic power, fresh ground pepper. Mix all ingredients together. Other ingredients: 1 large ripe avocado, 1 pint cherry tomatoes, 2 heads romaine lettuce, roughly chopped. To assemble, layer 1/2 head of romaine lettuce in a large bowl. 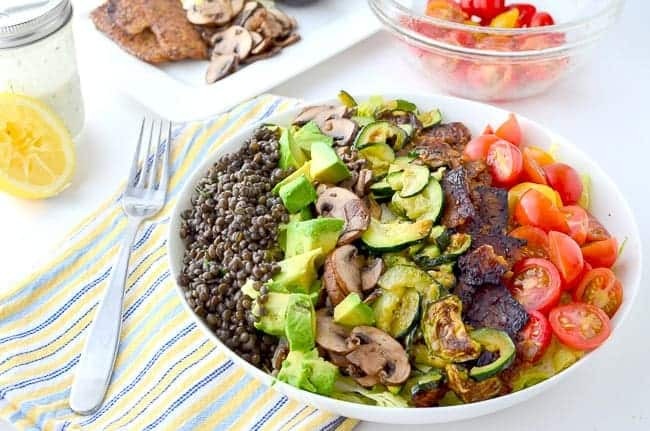 Top with 1/3 cup lentils, 1/4 avocado, chopped, 1/3 cup mushrooms, 1/3-1/2 cup cooked zucchini, 2 oz. tempeh bacon, 1/3 cup cherry tomatoes. Drizzle with ranch dressing. And there you have it. 5 servings of vegetables, 23g of fiber, 30g of protein. Done. Ummm yes please! I just ate dinner and I want this! 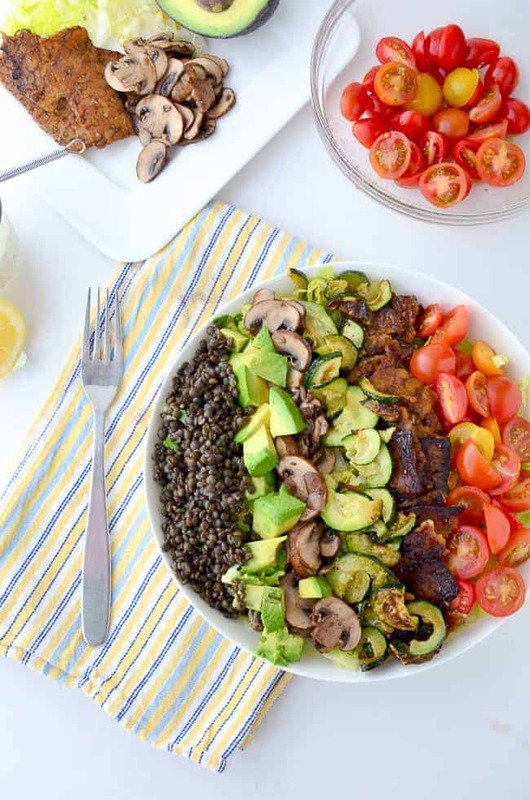 I’ve always wanted to make tempeh bacon and I love the idea of using lentils in salad which is something I don’t usually do. This salad is ridiculous in the absolute BEST way! I want it for lunch today! Luckily I am headed to the store after work. My husband will love this too. I was just thinking about lunches next week! How many calories are in this meal? It looks AMAZING but I think I could only eat half a serving. Hi Vanessa, the salad has 480 calories, 16g fat, 56g CHO, 26g fiber, 31g protein without the dressing. You could absolutely eat 1/2 of it and still feel full and satisfied! Yum! I would love to make this! And add some roasted corn…mmm. Oh my gosh this looks amazing.. I’m going to have to try it this weekend, I have everything except the Romaine. Looks fabulous and my two friends that recommended it to me both said it was awesome! Can’t wait! Where do i get tempeh? Never even heard of it. I see a squeezed lemon in your pictures! Where does it fit in? Thanks for the comment! Really hope you enjoy the salad 🙂 I used a squeeze of lemon juice in addition to ranch dressing. I love the taste of fresh citrus in my salads. I didn’t include it because I didn’t know if anyone else would! Tempeh is a fermented bean cake, popular in Indonesian cuisine and a great vegetarian protein. Are you close to a trader joe’s? That’s where I purchase my tempeh! Many natural grocers should carry it or you could find it online at iherb.com and Amazon. If you can’t find it, I would sub baked tofu for the tempeh bacon. This salad looks delicious! It’s been less than a week since I officially turned vegetarian (although technically I have been for two months now) and I’ve already gotten that question. This salad is a great response! I need to try tempeh. I hope you like it! I wasn’t a huge fan of tempeh when I first became vegetarian but now I am a tempeh-loving-gal! It’s my favorite meat alternative. This looks great-I’ve been experimenting with Tempeh on my own site recently and this looks yummy! Awesome Deborah! Hope you like it! This was really good. I didn’t change much except I left out the mushrooms (didn’t have any) and I grilled the tempeh and the zuchinni. The meat eaters in my family actually liked it. Even my brother liked the tempeh and his diet consists of meat and pizza normally. I’m a very picky vegetarian but this was something I could actually eat. i think I might try frying it after grilling next time to give it that bacon texture while still getting the smokey flavor. Awesome! So glad you liked it Shannon! Hey, nice salad for long hard day and when feeling lazy to cook something up. One quick question, can we substitute tempeh with ‘Paneer’ ? I mean technically paneer is farmer’s cheese but its more of protein and less of fats. Any views or ideas? Hi Ishan, you can substitute the tempeh with whatever you like! Paneer is a great source of protein and if you’d like to swap that out, nutritionally I see no problem. I don’t know how it will alter the taste but if you try it- let me know! Enjoy! Made my own version of this today with my partner and it. was. spectacular! We made a few changes: no tempeh, instead caramelised some onions for sweetness; mashed our avocado as we only had the one; switched tomatoes for sweet red bell pepper; olive oil instead of sesame oil w/mushrooms and added a little sriracha sauce (unlike the US, sriracha is something brand new to the UK which we’ve suddenly seen appearing in our supermarkets! ); no dill in our dairy free ranch sauce. Hands down the best salad we have ever eaten. As we have only been vegan for 3 months we’re still learning the ropes, and this has inspired so many more dishes. Thank you so much! Awesome Hannah! So glad you liked it! Im sure sure how you calculate it’s 5 portions of 30 grams of protein. 220 tempeh = 43g protein. if that’s 5 portions, then it’s only 17g protein per portion. 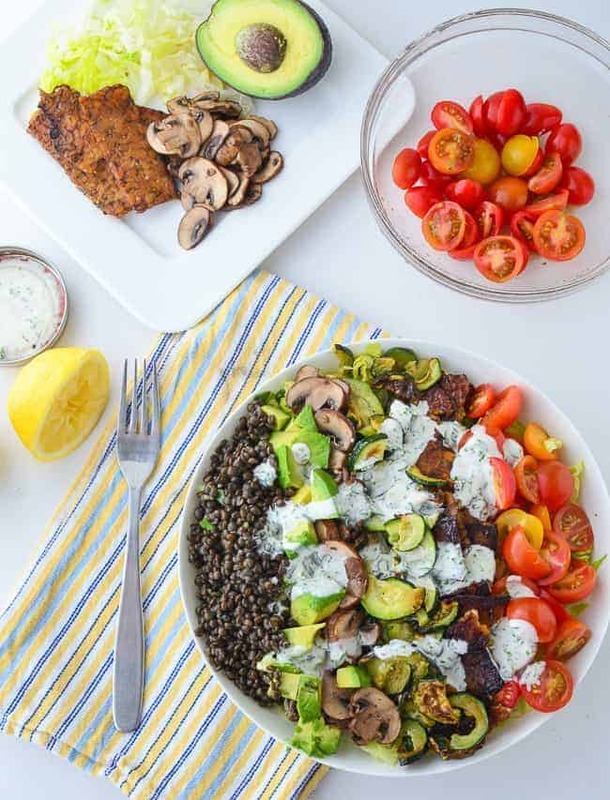 Hi Philippe- consider the other ingredients besides just lentils and tempeh; mushrooms, avocado, dairy-free mayo, soy milk will also provide protein, though small amounts. The recipe calls for 4-5 portions; 4 portions will yield 21g of protein, 5 portions will yield 28g of protein. Thanks! How do you cook the lentils? More specifically are you using lentils from a can or dry lentils? Do you have any suggestions for the best preparation method? Hi Lizzy, I don’t use canned lentils, usually dried. However- Trader Joe’s and Melissa’s Produce both sell already steamed lentils that are great in recipes like this. To cook from dried, cook on a stovetop, using 3 cups of liquid (water, stock, etc) to 1 cup of dry lentils. Be sure to use a large enough saucepan as the lentils will double or triple in size. Bring to a boil, cover tightly, reduce heat and simmer until they are tender. For whole lentils, cook time is typically 15-20 minutes.